You can get all latest update about Assam CEE 2019 from this web page, we are updating latest stuff here. All the aspirants who want to get admission in engineering courses within the state Assam, This All in one article will be beneficial. Here we are providing all the details about the exam such as Assam CEE 2019 Application Form, Eligibility, Syllabus, and Exam Date. All the Candidates must be an Indian citizen. The candidates have to be a permanent resident of Assam State and spend a minimum of 20 Years time period in the Assam state. The children whose parents are officers in all India services working in Assam state are exempted from the above condition. But it is necessary to study 7th to 12th class from Assam board. There is age limitation that Candidate must not below 17 years or above 21 years as on 1st August 2019. SC/ ST candidates got relaxation of 3 years and, and B.Sc graduates will get age relaxation of 1 year. Candidates whose parents are transferred to the outside of Assam can also get relaxation on the period for which their parents were living outside. All the Applying candidates must pass 12th examination without any grace marks in the same sitting from recognized board or university. Candidate must score 50% marks in the qualifying examination. There are also some relaxations for SC/ST candidates. SC candidates have to score 45% mark and ST candidates have to score 40% marks in qualifying examinations. All the expected events in Assam CEE 2019 are listed below with tentative dates. For Accurate dates, we have to wait for the final announcement. The application form is expected to be released Online in the 3rd week of April, and candidates can fill the application form until the 1st week of May. 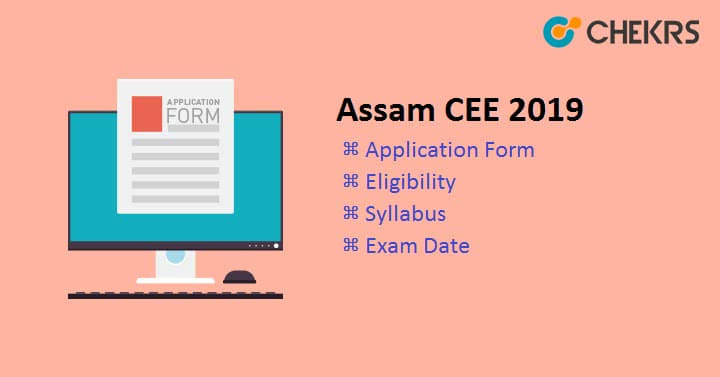 In this part of the Article, we are providing some major details about the Assam CEE Application Form and also the and procedure to fill up the Application form online. Go to the official website and find the link of Assam CEE Application form. Click on the link and Read all the instructions carefully, then click on the “Click here to Apply” button. On the next page you will be asked for all the required details such as personal, educational, communication, etc. fill it up very carefully because No correction or modification will be allowed after the final submission of the Assam CEE 2019 Form. After filling the application form you will be asked to upload Image and signature. Here upload the scanned images of photograph and signature. The dimensions of Photograph must be 200 width x 230 height, and 100 width x 180 height for signature. After uploading the above images, you will be redirected for the application fee payment. After the successful submission of Assam CEE 2019 application, don’t forget to take a printout of the application form. All the Candidates (from all the categories) will have to pay Rs. 600/- as an application fee. The application fee can be paid through online bode via debit card, credit card or net banking, and through offline mode via e-challan. Duration of exam will be of about 3 hours. There will be total 120 MCQ and maximum of 40 questions will be asked from each subject. Each question carries 4 equal marks. All the Candidates are advised to do their preparations as per the syllabus prescribed by the official authority. Basic Details about Assam CEE Syllabus are as follows. The Assam CEE 2019 papers will be based on the NCERT Syllabus by AHSEC, Assam. All the Aspirants have to study their 11th and 12th class NCERT syllabus. All the candidates have to study Mathematics, Physics, Chemistry, and English subjects. You have to do all the preparations but we can help you to prepare better, with some common but effective exam tips. Before preparations for ASSAM CEE Exam take a look at Exam Pattern and syllabus carefully. You can Use Flow Charts, Diagrams, and tricks to memorize small details easily. Organize your Study space and Practice on old Exam papers. Don’t avoid your health. Because better health will improve your memorizing power. The admit card will be released in the 4th week of May. All the candidates can download the Admit card by entering the “Application number” or “Date of birth” of the candidate. Assam CEE Hall Ticket will be only available via Online mode on the official website. The Assam CEE 2019 Admit card will have many details on it, Like Date of examination, Exam center, Timing, Rules etc. The Exam will conduct in following cities. The Exam authority will declare the Assam CEE result probably in the 2nd week of June 2019. The Assam CEE Results can be viewed online on the official page. With the Result, a merit list also will be published by DTE, Assam and on the basis of the merit list, the qualified candidates will be selected for admission. The authority will also release the answer key to help candidates to calculate their performance. After the result declaration, candidates must have to fill the ASSAM CEE Application Form Part-B to participate in the counseling. In Application form –B, all the qualified candidates have to clearly mention their choices of branch and college. On the basis of their declared result and preference, the exam authority will allot branch of study and college at the time of admission. The counseling process will be conducted through offline mode so the candidate has to be present physically at the counseling venue along with the original documents which are listed below. 10thAdmit/Pass Certificate as an Age Proof. (issued by Board or Council). 10th Mark sheet, 12th Admit Card, and 12th Mark sheet. Character Certificate from Head of the Institution. Admit Card of the Assam CEE-2019. Caste or Category Certificate (if Any) and Academic Gap Certificate (if any). All the candidates are advised to must carry their all required documents (as above) along with them at the time of admission. The final admission will be provided only after the verification of original document. Assam CEE 2019 will be a great opportunity for all the eligible candidates to get admission in engineering courses. So make sure to fill and submit the Assam CEE 2019 Application Form before the due date.